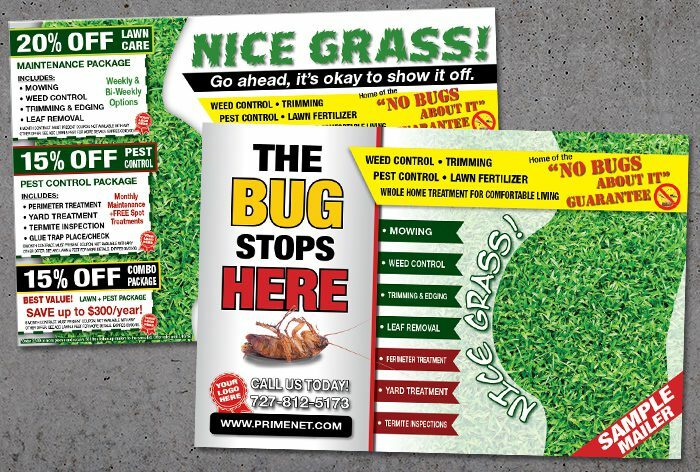 Combining similar home services into a cost-effective postcard campaign is a great way to get the best bang for your buck advertising your lawn care and pest control business via direct mail. Many pest control companies and lawn care businesses rely solely on online advertising. Online is a good (and cheap!) advertising resource for broad exposure on relevant forums and webpages, but it’s rarely targeted to a specific demographic, so while you may get leads from this, they are likely to just be inquiries which stop there – However, if your website has a nice landing page that your strategically targeted postcard offer points to, you double your chances of getting new business. Once that new business is established, your prospects should be placed on your follow-up list for offer after offer to keep them coming back to you on a schedule. Combo Deals and Follow-Up Reminders. Thanks! In addition to your online advertising, which yes, you should be doing, a good direct mail campaign can really solidify your message and get offers in the hands of those most likely to respond.